Did Chanukah happen years ago? Or is it happening now? Was there ever a time when it was not happening? The story of a little candle pushing away the monster of frightening darkness is ever-alive within each of us—and in the world outside of us. You might call it the cosmic mega-drama. Watch it happen at the dawn of each day and at every winter solstice, with every breath of life, every cry of a newborn child, every blade of grass that breaks out from under the soil, every flash of genius, every stroke of beauty, every decision to do good in the face of evil, to build where others destroy, to move humanity forward when others pull us toward chaos. All those and more are Chanukah. You would have thought the Jewish people and the ancient Greeks would get along. After all, they had so much in common. Both valued wisdom and beauty. Many Greek philosophers even acknowledged a single, great Mind behind all the cosmos, similar to Jewish monotheism. Well, they did manage somewhat—at first. The Jews tolerated Greek rule from the time of Alexander of Macedonia. Many Jews studied Hellenistic philosophy, and King Ptolemy had the Jewish Torah translated into Greek. But when King Antiochus attempted to force Hellenism down our throats, we rebelled. Antiochus forbade ritual circumcision. Mothers openly circumcised their infant boys in defiance. Antiochus forbade the keeping of the Sabbath. Jews were forced to leave Jerusalem so they could keep the day of rest holy. Antiochus forbade the study of Torah as a sacred text. Jews found ways to teach classes of children and adults in secret. When the Greeks raised up idols in the cities and towns and demanded that the Jews worship them, all-out war ensued. It was the first time in history that a people had fought not for their country or their lives, but for their beliefs and their right to religious freedoms. Problem was, the Syrian-Greek army was the most powerful in the world. Their soldiers marched in a compact formation of overlapping shields and long spears, almost invincible in those times. They had advanced weapons, were highly trained and, even brought elephants to the battlefield. The Jewish resistance, on the other hand, began with a handful of brothers of the priestly class, calling themselves the Maccabees. There were many acts of courage, but the Maccabees firmly believed that their victory came from Above. Eventually, they received a sign that it was so: When they took back Jerusalem and the Temple, they searched and found a single flask of undefiled olive oil—just what was needed to light the sacred menorah. Although the flask held only enough for a single day, the light of the menorah miraculously burned for eight complete days, providing just enough time to prepare new oil. To the Jewish people, this was like a nod from Above that yes, He was with us all along. Without miracles, we might come to believe that the laws of physics define reality. Once we witness the inexplicable, we see that there is a higher reality. And then we look back at physics and say, “This too is a miracle.” The miracle of a small flask of oil burning for eight days was this sort of miracle. Then there are those small miracles that occur every day. Those acts of synchronicity we call “coincidence” because in them G‑d prefers to remain anonymous. But when we open our eyes and hearts, we see there is truly no place void of this wondrous, unlimited G‑d. These were the sort of miracles the Maccabees saw in their battles against the mighty Greek army. Chanukah was a victory of few over many. Each Maccabee was a hero, essential to the victory. One could think that in those days, when the population of the world was so much smaller, a single individual would have more power to change the world. In fact, just the opposite is true. Technology and information have put enormous power in the hands of whoever wants it. Just sixty and some years ago, one madman came to the verge of destroying the world. His failure to develop atomic weapons on time is still inexplicable—it can only be attributed to the great mercies of the One Above who takes care of His world and promised that it would always stand. Today we have seen that not even an army is needed, nor warheads or missiles—but only an obsessive will to destroy. Such is the power of darkness. A thousand times more is the power of light, of any one of us to transform the entire world to good. A small child kissing the mezuzah on the door of her house, an act of kindness asking nothing in return, a sacrifice of convenience to benefit another—each of these things are like bursts of light in the nighttime sky. True, they make less noise. Rarely are they reported in the daily news. But while darkness passes like the shadows of clouds on a windy day, this light endures, accumulating until it leaves no room for evil to remain. Today’s Western society is built on the foundations of these two cultures, the Jewish and the Greek. Both treasured the human mind. The Greeks reached the pinnacle of intellect at their time. But the experience of Mount Sinai had taught the Jew that there is something greater than the human mind. There is a G‑d, indescribable and inexplicable. And therefore, a world could not be built on human reason alone. The idea annoyed the Greeks to no end. While they appreciated the wisdom of the Torah, they demanded that the Jews abandon the notion that it was something Divine. Ethics, to an ancient Greek, meant that which is right in the eyes of society. To a Jew, it means that which is right in the eyes of G‑d. The difference is crucial: ethics built solely on the convenience of the time can produce a society where human beings are treated as numbers in a computer, or where the central value is the accumulation of wealth. At its extreme, it can produce a Stalinist Russia or a Nazi Germany. A healthy mind is one that recognizes that there will always be wonder, because G‑d is beyond the human mind. And a healthy society is a balanced one, whose soil nurtures human accomplishment but whose bedrock is the ethical standard of an Eternal Being. AMAZING .. VERY facinating to read of an indepth stories linked with the Minorah and Chanukah. People need to be further informed about this especially non Jews around the world. Re: no war Having grown up in a world where war is far off in another continent, we have no firsthand context in which to place this. Consider, however, that for all of history until very recent times, terror, skirmish, battle and war were the default state of being. Peace was little more than the eye of the storm. No war "Some people are waiting for a final, apocalyptic war. But the final war is not fought on battlefields, nor at sea, nor in the skies above. Neither is it a war between leaders or nations. The final war is fought in the heart of each human being, with the armies of his or her deeds in this world. The final war is the battle of Chanukah and the miracle of light." hmmm The way I read Chanukah is that Jews were converting left right and centre. Matthias murdered one such convert before going on the guerrilla based tactical campaign against the Greek-Syrians. 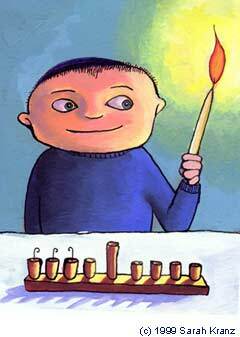 To me the miracle of Chanukah is not the oil, although it certainly is a big one. The greatest miracle is that the small army of Maccabees defeated the Greeks and thus Judaism survived. Most, perhaps all, other religions of that era did not survive the Greeks. After the victory, the Maccabees restored the Beit Hamikdash, and one cusp of oil burnt for 8 wondrous days. Thank You Very in depth and easy to read article.